Not Enough SQLs? What's Your Sales Cadence? One of the most important ways to keep your sales development reps (SDRs) focused on growing their pipeline is by using a sales cadence. Now, if you are not familiar with this term it simply means a defined schedule indicating when reps should reach out to the prospects that they are pursuing. Every sales organization has a slightly different approach depending on the tactics they are using but a typical cadence may include calls, emails, social media activities, webinars, or all of the above. The important thing is that a cadence exists. Defining your sales cadence and sharing it gives sales managers and executives a certain level of comfort knowing that the SDRs are taking the necessary steps to accelerate leads through the buying process. Often, as we begin to talk to our customers and prospects about a sales development program, they ask how many times an SDR will contact each lead. There is no magic number. At Imagine, we design a sales cadence based on the client, their goals and the content that will be used to support the sales effort. One thing our experience (and other data) has taught us is that many SDRs give up far too early. Studies have shown that the average SDR gives up after attempting to reach a lead only 1.5 times. In most cases, that is not enough. Our data shows that it typically takes eight to 10 attempts for an SDR to successfully make contact with the right person. After 10+ attempts, our SDRs move on and pursue other opportunities. Let’s talk about examples. As I said before, a sales cadence is different for every organization. On top of that, many inside sales leaders that agree a sales cadence is important to the success of a team, there are vast differences and opinions on how to structure a sales cadence. We have a video that we have put together that talks about the sales process and cadence used to turn leads into prospects. At Imagine, our own internal SDRs that are focused on growing our business use a minimum 10-Touch model for target leads and a minimum eight touch model for follow-up on inbound marketing leads. 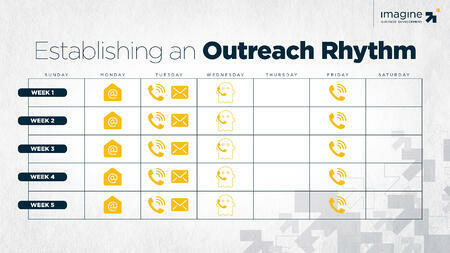 Our SDRs may reach out multiple times a day leaving voicemails or making a ghost call. Typically, the sales cadence we use lasts up to four weeks. That said, we have some clients who use a two to three week sales cadence because of the nature of their business. Again, it’s important to understand that sales cadences are not “one-size-fits-all.” Every organization will have a unique cadence based on their product or service offering and their market. Notice what’s not included? There is no mention of revenue created or anything about sales dollars. It’s important to understand that a properly utilized sales development team that is focused on qualifying opportunities and contacts will not play a role in closing deals and generating revenue. That falls on the shoulders of the sales executives. I could go into more detail but that could certainly be another blog post altogether. I hope this post has provided some insight into the importance and necessity of a sales cadence for your sales development team or inside sales team. Too many leads fall through the cracks or are not followed up within a timely fashion decreasing your opportunity for conversion. With our number one goal being conversion, defining and executing a sales cadence is our most useful tactic. However, it is unfortunately also the most overlooked tactic. If your team is not generating the sales qualified leads that you’re looking for and you’re not implementing some sort of sales cadence, the issue might be in your process and not in your people, your offering, or your database of prospects.